Have you ever come across a blog post that you enjoyed so much you wanted to easily share it with the readers of your own blog? Sure, you can copy and paste the link and perhaps even a snippet of text with your own comments, but overall it’s not a particularly enjoyable experience. We wanted to change this and make sharing other posts with your readers as easy as posting to your blog. 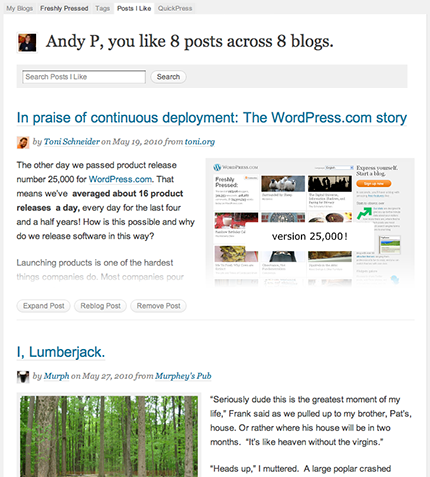 Today we’re introducing a new like and reblog feature enabled across the whole of WordPress.com. When you’re logged in to WordPress.com and viewing a post you’ll notice a new link in the admin bar at the top of the page. If you really enjoyed the post then you can click the “Like” link to signify this. This will then show the author how many readers liked the post. Once you’ve liked the post, the link will change to “You like this” and you’ll be presented with some new options via a drop down menu. You can also access this menu at any time in the future by hovering over the “You like this” link in the same way other menu items work. When you reblog a post the details are auto populated on the QuickPress form. If you decide that you want to share the post with your own readers, you can click the “Reblog this post” link and you’ll be taken to the new QuickPress tab on the WordPress.com home page. This will auto-fill a snippet of the post text, a link back to the original post, and a link to the blog. If the post includes any images we’ll also automatically add a thumbnail image to the reblog post. Finally you can add your own comments to the reblog post then select which blog you’d like to post it to (if you have more than one). Even if you are not going to reblog a post you can use the QuickPress tab as a centralized and easy way to post to any of your blogs across WordPress.com. Alongside the new QuickPress tab you’ll also notice there is a “Posts I Like” tab. 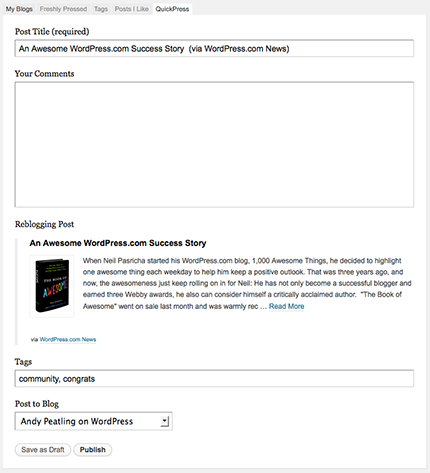 This will aggregate all of the posts that you have liked across any WordPress.com blog. Browse all the posts you like with full post display and a handy search tool. Instead of this just being a list of post titles, we fetch the whole post content along with any media so that you can use this tab as a place to browse any of the posts you like at a later date. There’s also a handy search tool that will allow you to easily find that awesome post you want to reblog, but it’s just been a little too long to wade through all the other great posts you’ve liked since. Once you’ve found the post you can reblog it simply by hitting the “Reblog Post” button. All these features are now live and ready to be used (maybe you’ve already noticed the “Like” link for this post?) so go forth and start liking and reblogging, we hope you find it useful. This is an awesome feature!! WordPress rules!! how about enabling Facebook Like across WordPress.com???? There are no immediate plans for Facebook integration, but we may tie it in if you’ve authenticated your Facebook account via our publicize feature. How about Facebook Like feature? So if someone chooses to “Like” your article, the entire article gets republished in their “Like” list, right? If that’s right, how does that saved copy affect readership stats and commenting on the originating blog? If the Liked article is re-read four times — are those re-reads counted or is only the first pull counted? Are the saved “Likers” able to comment on your saved article from their Like area? The whole post is displayed in their like list, to comment on the post you’d revisit the original. Stats are only measured on the original post. Very nice feature to see on wordpress. Only one thing I’d love to see.. Which is “Ask me” feature. It is used in tumblr.com very nicely. I’d love to see it here in my favourite blogging site. not all posts I want to repost (reblog?) are those which I like.. Most of the time I simply want more people to know about it regardless I like it or not. Is there a way to repost a post without having me to like it first? You’ll need to like it first, but we’ll be looking at more ways to integrate the reblog feature around WordPress.com in the near future. Thank you so much! That’s an awesome new feature! Great new feature. Thank you! Pingback: Like WordPress.com « Wir sprechen Online. WordPress.com is becoming a much more holistic and compelling platform. Andy…any plans for a plugin for WP.org folks? Even if it ties into a WP.com dashboard or blog it would still be great. The gauntlet has been thrown to Posterous and Tumblr. The features are written to be extractable into WP.org plugins so I’ll be working to get those released in some form. WOW! – Just what we needed to tie up the WP Community stronger and closer together! Brilliant feature!! It will definitely make a stronger community of bloggers that could help another to become better bloggers. Great work. I do like the like feature, although the reblog seems to be an attempt at becoming “Tumblr 2.0” (which I also use). One quick question: If someone does reblog a post with a video (say VideoPress), does the reblog include a thumbnail or quick snapshot of the video, or does it just capture the text? If it captures the video (albeit via smaller size), is there a way to choose the thumbnail if we are using VideoPress? Is there an opt-out option or are we compelled to allow others to reblog our posts? There’s no opt-out as it stands, but allowing others to reblog your posts will ultimately bring more people in to read your blog. If you’re concerned then you can still make a post private, or your entire blog private. It just keeps getting better and better here at WordPress. Totally awesome! I really like the idea of this feature. Good work! This is a great new feature! Thanks so much for adding it! Too cool and this may slow down those that copy and paste entire posts without attribution. Thanks, WP. Guys, that was feature, I always missed! I think this feature has a lot of great potential. Every time I think about hosting my blog somewhere else, you guys keep adding more and more great things to keep me here. Great job guys! Thank you so much!!! I love love love this feature! You guys are amazing! Fantastic feature. I’m so glad you didn’t leave at just “Like,” the way Facebook does. This is really useful in promoting traffic between blogs. Thanks for a great new feature! I was just thinking about how I could share a post I recently read, great feature! Sweet. Anything that will allow my blog to receive more views is welcome. But is there a way to prevent others from doing that with your blog? Sounds great. It will let quality posts be seen and appreciated by more people. I will tell you when I faint hearing and using your awesome features. Sounds like Tumblr – but faster than the way I highlight posts I like now. Thats like creating a niche.. Without any fuss of saving the links separately and then forwarding.. I am already liking it..
WP is getting better than the Best.. It is a good feature for WordPress so i can reblog on any post on wordpress.com that I like. Awesome, WordPress! I just got a compliment from someone who I featured in my blog post about a cycling program he helped spearhead in our city. Do I copy and paste his email to me in the reblog feature? Or does the feature offer something simpler? I barely have time to test this great feature..need to pack for a plane trip. Nice feature. Are there any plans of a flattr.com widget for wordpress.com blogs in the near future ? Hi guys – can you tell if someone has ‘liked’ your post? At the moment likes are simply tallied, but we may extend this to show basic details in the future. Thanks for integrating some of the best parts of other sites I like into a site I LOVE. Thumbs down. You are treating your registered bloggers as your customers by forgetting the customers of the bloggers themselves (their visitors). This exclusive company wide Like feature is going to add more confusion for the people amid all other Like buttons everywhere. it would have been better if you had not fallen for this trend which is evolving people on the internet backwards. Now, what is next, a ping.fm for all these separate Like buttons and then ultimately they will show up under plethora of AddThis html code? Where is the innovation? Amazing! Thanks for holding back with Facebook. Even though I have an account there, I’m not keen on it, specially with their “sharing of information” policies. I find it cumbersome to get any message across with their interfaces. BTW, the reblogging is an execellent idea! Very useful. We do not ALL like to reblog nor do we all like to be reblogged. An optout feature would be a very welcome addition to this new function. I assume the decision not to allow opt has been made with legal consultation. An alternative to making our blogs private is to can movethem off any platform platform that advocates and provides tools for breach of copyright. I just noticed that a few minutes ago and think it’s spectacular! This is going to be very helpful. 🙂 Thanks a zillion! I’m seeing a lot of comments about a Facebook Like feature and personally I’m opposed—not everyone uses Facebook, and not everyone wants to see it turning up through a completely different medium. When did blogging become social networking? Wow, thanks WordPress! And thanks to the discussion I understand better the pros and cons with this new feature and am confident you all will improve it to address the valid concerns here. Allowing readers to Reblog someone’s content should be an opt-in feature and not mandatory. Also, the new Like function is in addition to Rating a Post. I have my doubts that my WordPress.com readers will take the extra time to rate my posts if they’ve already “Liked” them. I’m sorry, this feature is nice and all…but can’t we just call it “reblog”. All these ‘like’ buttons are getting on my nerves. FaceBook just had to go overboard and turn fanpaging into ‘liking’ and then YouTube picked up the idea and changed their perfectly good five-star rating system into a ‘like’ and ‘dislike’ system. Whether or not liking has the same effect on WordPress doesn’t matter…this trend is repetitive and too market-y for my tastes. Not only that, but I agree with others that reblogging someone’s content should be an opt-in feature, not mandatory. It doesn’t affect me because I don’t blog about anything serious enough, but I know some people are particularly wary of plagiarism and breach of copyright. Just brilliant ! It`s useful ! Working hand in hand between blogs. This new feature is remarkable WP. Keep it up. Btw, I thought this page shouldn’t be used for queries (mine in one post was not approved because I did), yet I’m seeing a few earlier comments here with questions. I hope everyone’s fair enough. Thanks. One more innovation from WP.com! Interesting. I just finished reading this week’s TIME Magazine expose entitled “FACEBOOK and How It’s Redefining Privacy” – a must-read article which details in greater clarity the extensive and unrelenting profiling Facebook uses to make billions of dollars off of its unsuspecting users. Most recently facebook has employed the “Like” trend – tracking user activity, logging personal preferences, and building an extensive profile on each one of us for self-serving marketing purposes. Perhaps you can imagine my surprize and unease today to see WP’s new “Like” feature introduced. I do not know enough yet about this launch to openly support or oppose it, however I am seeing plenty of red flags here – and I am disconcerted that WP may feel the lure of the Billion Dollar Facebook bandwagon too hard to resist. Is WP hoping to find a way to cash in on our “Likes” in the future? I hope this is not the case. At any rate, choosing to use the “LIKE” term is unfortunate in today’s growing distrust of Facebook’s squirlley practices. 1. I do not understand why we have to actually cast a personal vote to “like” a post in order to share it. Why can’t we just click a “share” button? 2. I do not see a reason why an archive is being built for each user that will include the entire post. This seems contradictory to the entire goal of encouraging increased traffic to return to read a post at its home source. Allowing someone to keep a copy of our entire post will actually eliminate the need for a reader to ever return to the blog in question, thus reducing the post stats, and blog’s stats in general. It also raises plagerism concerns. Giving us a “Share” button, and creating an archive with a summary and a link back to the original post is appropriate and more than sufficient. Anything other than that risks infringing on Blogger Rights. A couple of things: It is impossible from preventing someone from reblogging your posts, whether there’s a feature to make it easier or not. You posts can be aggregated and republished with RSS scrapers. Your posts can be copied and pasted. Unless you maintain a Copyscape subscription and use it regularly, not only can you not prevent it, you may not even know about it. The new feature makes it easier, at least for other WordPress.com bloggers, to share your posts, but it also helps guarantee you will be properly attributed, and that use of your material will fall under “fair use.” In a very real way, it discourages blatant plagiarism. I’m not trying to argue against an opt-out feature, just presenting a couple of things to think about (if you haven’t thought of them yourself already). At any rate, another great feature by WordPress.com! Thanks for this. This is great thank you so much..
Pingback: Reblogging: WordPress.com takes the thinking out of blogging « Opposable Thumbz? What if you hate a blog so much that you dont want to star it but in stead throw it into the sun =/? Cause I sooooo am chucking this into the sun :P.
Joking of course, great feature man :). I hope I can make use of this one day. Wow, this is a great great feature. Thank you. I agree that taking a blog post without the author’s permission is going to happen regardless of this new added feature. Just like taking pictures that are published on someones blog (be careful of what you don’t want to share!) If you blog and it’s open to the public, it’s free for the taking. It’s just the way it is. It’s pretty much share and share alike and you just have to consider it a compliment that they want to spread your words around. I’ve seen people include a personal note about , “Please do not C/P this ” and I always wonder if consideration is given to that. The new feature is nice! Thanks again for giving us more surprises! I really like this feature. Thanks for adding it. I agree with some above that ‘Like’ isn’t always the most appropriate term. Don’t wordpress.com bloggers ever debate or disagree with each other? There are plenty of other things you can do with a post which don’t imply a value judgement: note, add, remember, record, bookmark, share… Now is really not the best time to start copying Facebook. Great feature! I will definitely be using it. Thanks! Nice :), I’m sure this will be a well used feature. oops … will this feature be available on WP.net ? It would be cool to have a page that aggregates the liked posts. Something similar to Digg. Or a public profile page that shows your liked posts so that you can share it with other. … I guess reblogging it would work as well, but some blog posts that I like I don’t necessarily want to re-blog. Wow, this is a great feature. I love it already! I just wonder if anyone is going to “like” my posts that much to repost it on their site…(mulling this over). My parents recently boycotted my blog and articles on other sites because they thought my writing was too edgy! Fortunately their nasty comments backfired and I am getting more traffic…(at least in the past couple of days). This is really cool! WordPress I love the way you think. I also love how much my blog traffic has been growing over the last several months. It’s awesome!!!! Keep it up. This seems like a marvellous idea! i will join my vote to those requesting an opt-out option, if not for the “like” feature then et least for the reblog feature. if i wanted a blog for promiscuous reblogging i’d be using tumblr (actually, i do use tumblr exactly for that). and please, if you do connect to facebook’s “like” feature, please set the default to disable. Wow! This we be an easier way to find great posts! Great feature, I like what you guys are doing!